Sometimes as a new mom, I feel like I am experiencing a small part of adolescence all over again. Sleepless nights, learning new skills and little control over hormones are just a few things that remind me of those teenage years. The most debilitating of these “symptoms”? Definitely the lack of sleep. I feel like I can barely function some days. While facilitating a Support Group at a local Alternative High School this week, we talked about school and discussed how they felt about it. With only one exception, everyone in the group mentioned tiredness and how it affected their school performance. They were falling asleep at their desks, unable to focus on their work, and too tired to even come to school some days. They were walking Zombies! However, when I asked how they could make school better, none of them talked about getting more or better sleep. Isn’t that interesting? Even though sleep is the one thing they need, they didn’t seem to see how missing out on sleep or going to bed late could negatively impact their whole day. A few weeks ago my son, Sawyer, went through a sleep regression that had him waking up every 2-3 hours through the night. I had gotten used to waking up once a night but two or three? I was thrown for a loop! That week and a half, I noticed several things. I was unfocused. I was grumpy. I was lazy. I was emotional. I found myself apologizing to my husband more than usual. Now I am not saying that during normal weeks I am never unfocused, grumpy, lazy or emotional (because I am), but I notice significant increases in these areas when I am tired. It can cause accidents. Did you know that driving sleepy can cause similar reaction delays to driving drunk? When our students don’t get enough sleep, they could be a danger to others and themselves! It can impair memory and learning. Not getting enough sleep can harm cognitive processes. This means that it affects alertness, focus, attention, and reasoning. When teenagers don’t get an adequate amount of sleep, they also won’t be able to remember what they experienced throughout the day, having a major affect on learning and retention. It can lead to depression. Sleepiness can contribute to the symptoms of depression and anxiety. It can also create a vicious cycle – lack of sleep causes depression, and in return, depression can make it hard to fall asleep. Our teenagers do not need another thing that leads to depression and anxiety. It can cause health problems. Sleep deprivation can cause many health issues from heart disease to obesity. It makes sense if you think about it. Our bodies need sleep to function and when you take that away, your body suffers and tries to make up for it in other ways. It can impair judgement. When teens (or people in general) do not get enough sleep, they cannot accurately assess events or experiences which can lead to a lack of judgement. This can also apply to a lack of judgment about the affect of sleep-deprivation! Teenagers are in one of the most important periods of growth. Their brain is developing, their body is growing, they are learning to interact socially. To do these things positively and set them up for success in the future, they need sleep. Plain and simple, this is one of the best things you can teach your teenager today. 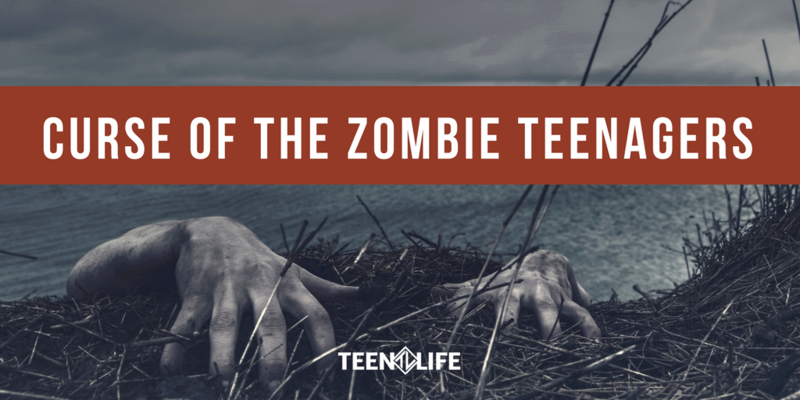 They don’t have to be Zombies just because they are teenagers. They can be functioning, smart, witty and alert – if they get the sleep they need! Let’s encourage teens to turn off the television or gaming system, put down the phones and go to bed at a decent hour. They may push back at the request, but they will be thankful when they are healthy, productive, happy, and making good decisions. How have you seen the impact of lack of sleep? What things can we do to encourage teenagers to get more sleep? Share your ideas – we would love to hear them! Karlie Duke was in one of Teen Life’s original support groups and now is our Communications Director. She is passionate about encouraging students to live better stories. Wonderful insight, Karlie. As we age, sleep needs change because our bodies tire more easily. Teens and 20-somethings tire quicker but their active minds appear not to recognize it. Your usual good work!